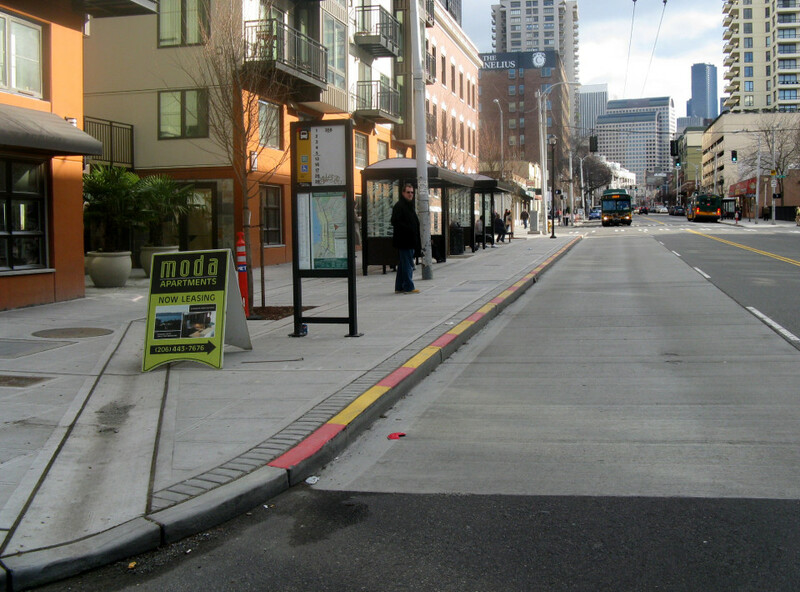 Boarding bulb stops use curb extensions that align the transit stop with the parking lane, creating an in-lane stop. Boarding bulbs enable side-running transit vehicles to stop without making large lateral shifts. Boarding bulbs improve speed and reliability, decreasing the amount of time lost when merging in and out of traffic. Boarding bulb stops can become a focal point for improved public space along the street, creating space for waiting passengers, furnishings, bike parking, and other pedestrian amenities and community facilities without encroaching on the pedestrian through zone. Boarding bulb stops are applicable in both dedicated and mixed-traffic conditions, wherever transit vehicles operate in offset lanes without right-side bike facilities. Boarding bulbs can be installed at near-side, far-side, and mid-block stops, at both signalized and unsignalized locations. Boarding bulb stops are especially applicable where merging into traffic from pull-out stops creates operational delays. 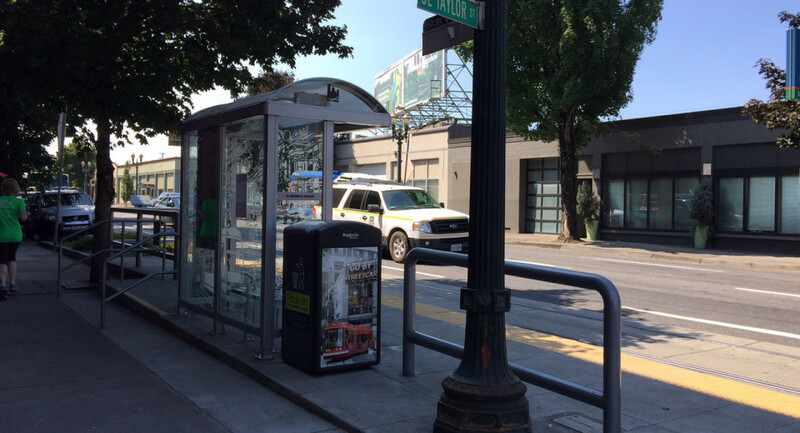 Use where transit passenger volumes require a larger dedicated waiting area than is available on the sidewalk. Boarding bulb stops allow transit vehicles to make in-lane stops, reducing dwell time and transit delay. A study in London found that passengers were able to board up to 50% faster per passenger from bulbs than from curbside pull-out stops. Boarding bulb stops provide more space for transit passenger amenities while maintaining a clear pedestrian path on the sidewalk. In one application on San Francisco’s Mission Street, bulbs expanded available queueing space at the stop 64%, and resulted in a 132% increase in space available to each pedestrian. Additionally, vehicle and bus speeds both increased 7-46% from previous bus bay operation. When bus bays were still in use, buses often did not pull completely from the traffic stream and still created delays. While buses making in-lane stops do delay traffic while dwelling, they require less time to pull back in, resulting in mutual benefits to vehicle and transit traffic. Kay Fitzpatrick, et al. Evaluation of Bus Bulbs. TCRP Report 65, Transportation Research Board (2001). When placed at intersections, boarding bulb stops also act as curb extensions to shorten pedestrian crossings. 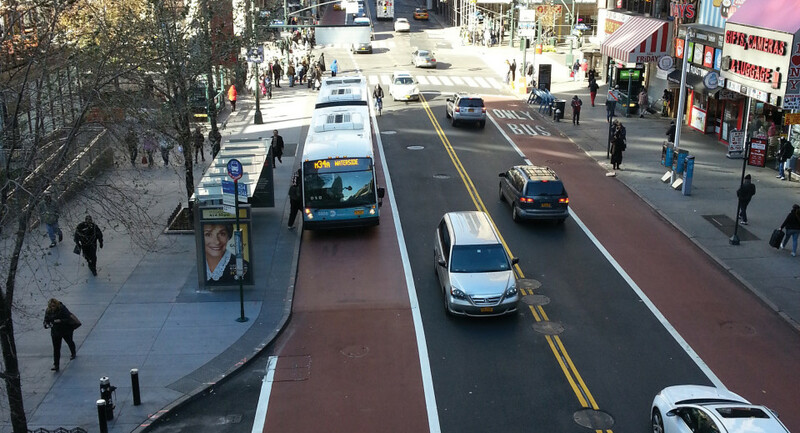 In-lane stops can reduce bus and pavement wear and tear, reducing maintenance costs. Boarding bulb stops shorten stop length, eliminating transition distance required to leave and merge back into traffic at pull-out stops. Space can be re-purposed to provide streetscape improvements such as parklets, bioswales, or additional bike and vehicle parking. Coordination between design and transit operations staff is needed to create effective, accessible boarding bulb stops (ADA Std. 403.5.1). 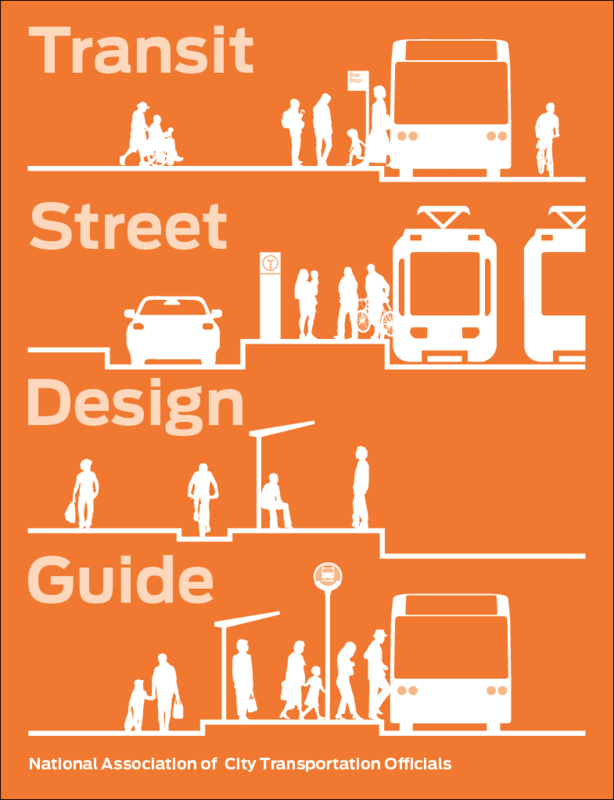 Designers should work with transit providers to determine the clear width necessary to create fully accessible boarding, which may vary based on vehicle type. Overhang into the travel lane is often needed to create small enough clearances for rail vehicles. If buses operate in the same lane, driver training may be necessary. Bulb stops often require drainage modifications; if catch basins cannot be moved, use trench drains covered by walkable grates along the length of the boarding bulb. Additional width may be needed to accommodate the trench drain. Boarding bulb width must meet accessibility requirements (ADA Std. 810.2.2). With most ramp technology, boarding areas at each accessible door must be 5 by 8 feet, along with 4-foot clear paths to reach each accessible door (ADA Std. 403.5.1) (see page 67). Shelters, seating, trash bins, plantings, vending machines, and utility boxes must be placed clear of accessible paths. Cross-slopes no greater than 2% should be provided along the accessible paths and landing area. Coordinate to ensure placement of accessible boarding areas is compatible across all vehicles in the transit fleet serving the stop. 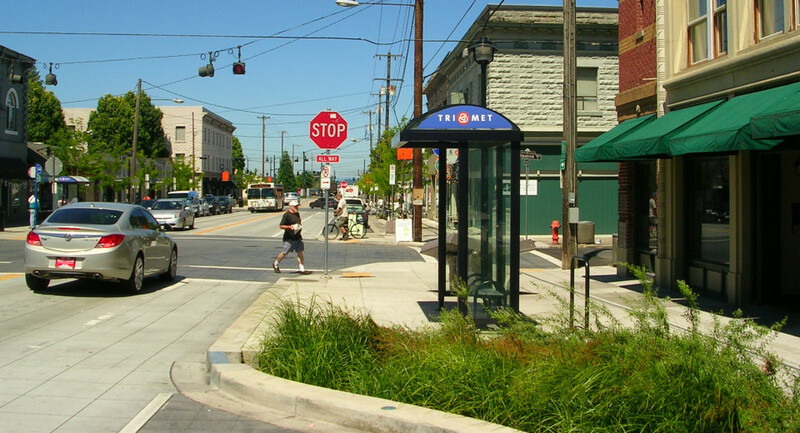 At stops adjacent to crosswalks, provide at least 10 feet of clear sidewalk space, ahead of transit vehicle at near-side stops and behind the transit vehicle at far-side stops. If shelters are placed on boarding bulbs, they must be placed clear of front- and back-door boarding areas. Boarding bulb length is determined by the boarding area required for the expected number of buses dwelling at a given moment (see page 62), but should be at least long enough to serve all doors of at least one design vehicle. Boarding bulb stops should include passenger features like shelters, seating, wayfinding, and route information. At bus stops, extend the bulb to within 2 feet of the edge of the travel lane; bulbs typically extend 6–8 feet from the existing curbline, and require minimal lateral movement for bus access. Include green features like bioswales or planters to improve streetscape and stormwater recapture. Where traffic buildup behind transit vehicles is of concern (i.e. where a street has one travel lane in each direction), periodic pull-out stops may be used to allow vehicles to pass buses. Priority treatments to allow buses to re-enter traffic should be provided. Where local and rapid/limited service serve the same corridor or route, rapid stops may provide a combined pull-out/in-lane stop—where rapid service stops in-lane, local buses pull-out. Pull-out stop is located before the bulb stop and serves the local service. Each stop should include its own “pole and sign,” as well as legible rider and route information. Distinguishing between local and rapid service stop locations is critical for trip planning. Rapid/limited bus service is accommodated by the boarding bulb. Regardless of arrival order, rapid buses are able to jump local buses in the queue and allow transfer between services. Curb radii at the back of the bulb must be great enough to accommodate the local bus’s transition back into the travel lane. Stop amenities (e.g. shelters, seating, wayfinding, and trash bins) can be placed on the bulb to preserve capacity and throughput of the sidewalk. For rapid service, stop shelter and amenities should be more robustly designed, including expanded capacity and seating, maps and real-time arrival information, and wayfinding. Concrete bus pads are “S” shaped and continuous through the stop, conforming to the shape of the curb. Where boarding bulbs involve a height change, they must provide an accessible ramp to sidewalk grade (ADA Std. §405). Steps may be used to provide non-accessible entries and exits to create multiple access points. On platforms serving buses and LRVs, concave transit curbs can be used to enable buses to pull within 2 inches of the platform edge. Curbs may have an inset lip to allow the streetcar body to slightly overhang the platform while still allowing buses to gain close access. References for Boarding Bulb Stop: 5 found. Dongho Chang. "Expanding Networks to Seattle’s Job Centers." Seattle Department of Transportation, Seattle.